The Zumwalt 12 will be arraigned on August 2 following their arrest at the Bath Iron Works ‘Christening’ of a $4 billion destroyer ship. 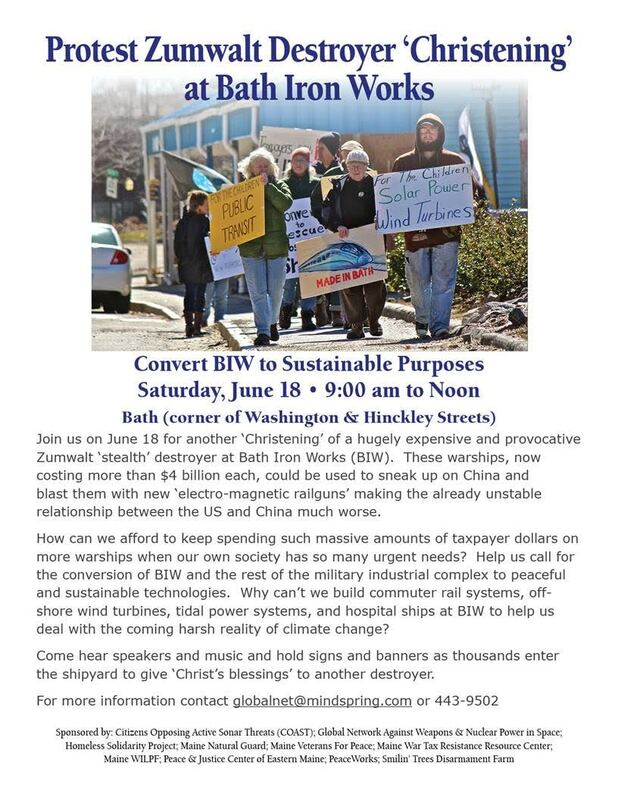 After the Zumwalt 12 sat down in the street and were arrested at Bath Iron Works on June 18 they were taken to police headquarters and charged with ‘Obstructing a public way.' Their arraignment will take place in West Bath District Court at 1pm on August 2. The Zumwalt 12 intends to plead not guilty and will seek a unified trial. Bar Harbor attorney Lynne Williams will represent the group. Statements from some of the Zumwalt 12 about their action. Bruce Gagnon: "We wanted to "interrupt the celebration of endless war and corporate profit" going on inside the event. 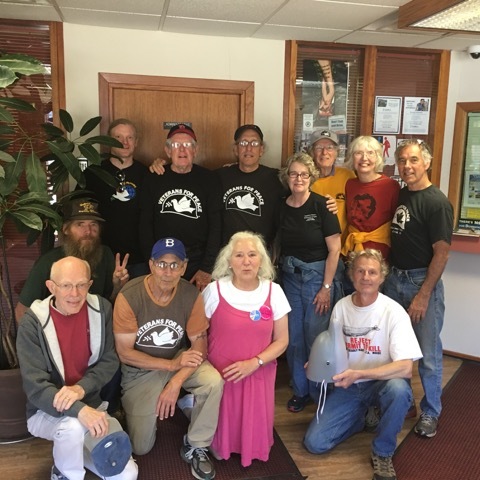 All the Maine big wig elected officials were there - Republican and Democrat alike - all on their knees begging for more $$$$ to build more damn warships while the rest of the nation is put on life support. We called for the conversion of BIW to build rail, solar, wind, and tidal powers systems so the future generations can have a life. The Pentagon is the recipient of the golden treasure chest that the pirates in Washington have grabbed. Nothing good can happen until we take the national treasury back. We don't need a war with Russia and China. We are dealing with fascists now and we must move into the streets quickly. We found a lot of support from the law enforcement crowd today - one police officer told one of the Zumwalt 12, "You all are the conscience of the community." Resist and survive.....you are not alone!" Arrests underway in Bath at General Dynamics' BIW shipyard on June 18, 2016.